The goal of this project was to produce a self contained reading lamp that could be used by students in developing countries for reading at night. The circuit can be used for a wide variety of lighting applications. 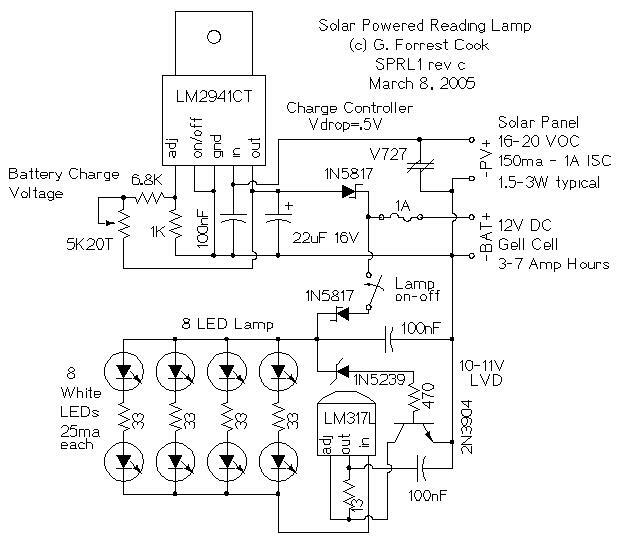 The reading lamp consists of a small solar panel, a standard UPS style lead acid battery, and an LED circuit board. The circuit board contains a low power solar charge controller (regulator), a set of 8 white LEDs, a switch, an LED current regulator, and a low voltage disconnect circuit. The circuitry will insure a long battery life by preventing over charging and excessive discharging. The circuit was designed to work with lead acid batteries, it should also work with a string of 10 NiCd cells. Both the charge controller and LED regulator circuits can be used independently for other applications. Newer VW and Audi automobiles come with small solar panels for keeping the battery charged in the sales lot. These panels are available on eBay for around $15 and are a perfect fit for this project. 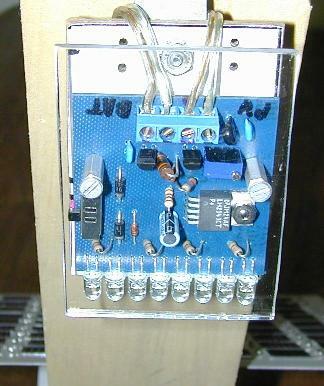 An inexpensive 12V 7AH lead acid gell-cell battery that is typically found in a computer UPS is also a good fit for this circuit. Be sure to use a new battery. The charge controller section consists of an LM2941CT low dropout voltage regulator and a 1N5817 schottky diode. The regulator determines the battery full voltage, this set-point is adjusted by the 5K 20 turn trimmer potentiometer. The 1N5817 schottky diode prevents the battery from discharging through the voltage regulator during the night. It also protects the circuitry against reverse battery connection. The V727 part is a transzorb, it absorbs lightning induced voltage spikes above 27V. The fuse prevents short circuits from burning up the battery wiring. The 8 white LEDs are connected in series with an LM317L IC that is wired as a constant current regulator. The 13 ohm resistor sets the regulated current to 100ma. This current is split evenly through the four pairs of LEDs. The 33 ohm resistors help to keep the current through the four LED pairs balanced evenly. The 2N3904 transistor, 1N5239 zener diode, and 470 ohm resistor form the Low Voltage Disconnect (LVD) circuit. Current through the LED starts to drop when the battery voltage drops below 10.8V, the circuit shuts off almost all of the current when the battery drops below 10V. The 1N5817 schottky diode blocks current flow in the event of a reverse battery connection. The lamp consists of a small wood battery box and a vertical board for holding the LED assembly and solar panel. 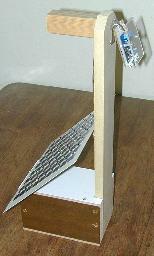 A small carrying handle protrudes from the top of the vertical board. The LED assembly consists of a small printed circuit board and the various parts. It is sandwiched between a piece of hard-board and a piece of clear plexiglass to protect the circuitry from physical damage and short-circuiting. The battery used for this device is a standard 12V-7 Amp-hour gell cell UPS battery. The solar panel is home-made, two or three parallel-wired GM-684 12V 60ma solar panels (p/n 08SLC09 from Elecronix Express), would be a good substitute. Turn the potentiometer, VR1 25 turns clockwise. turn VR1 counter-clockwise until the battery voltage stabilizes. re-adjust VR1 for the final desired full voltage setting. few hours of direct sunlight each day. Turn the LED switch off. the sun to fully recharge. Night: Use the lamp as you would use any other reading lamp. will shut the lamp off when the battery is nearly empty. rarely reach the Low Voltage Disconnect (LVD) point.